Simply dripping with jewels, the Annabella is a breathtaking dress that will sparkle with your every step. Shimmering hand-beading frames the decolletage, forming delicate cap sleeves to balance the flowing silk skirt. All Annabella dresses feature a hand beaded silver embellishment, a 100% Silk Dupion bust, and 100% Silk Satin skirt lining (with the exception of the Summer Silk Chiffon Skirt and Fitted Silk Crepe De Chine skirt options which feature a power mesh lining). Annabella can be customised with your favourite skirt option: Brocade Silk Chiffon, Fit & Flare Lace, Fitted Silk Crepe de Chine, Silk Organza, Silk Tulle, Slim Line Lace, Slim Line Silk Chiffon and Summer Silk Chiffon. Every Annabella skirt option features a modern, in-built train that can be easily bustled with a single silk-covered button. An open back finished with the signature Anna Campbell silk bow. Available in Ivory and Bone (Summer Silk Chiffon and Fitted Silk Crepe de Chine Skirt options available in Ivory only). 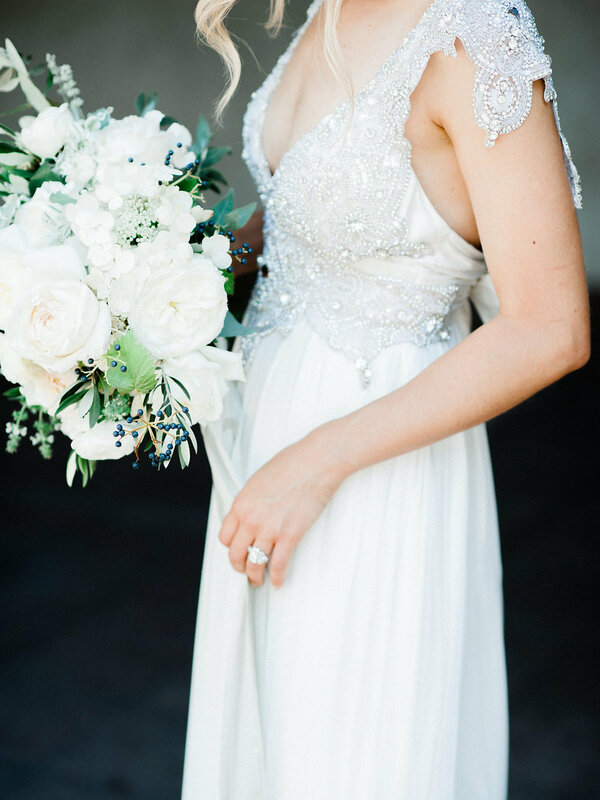 Vintage-inspired for boho bridal beauty, Anna Campbell custom wedding dresses are handmade from luxurious laces and silks, exclusive to the brand, and are embellished with hand-beading, sequins and all things that sparkle, for our bohemian, free-spirited brides!